As promised, here is a portrait of the Clarke family made a few years ago in felt by a clever crafting friend. They are not only pretty representative in height and character, but also fit inside each other, from the smallest up to the largest, like russian dolls. Like many people, I am not keen on being in front of a camera and much happier behind it...so when it came to my profile picture I chickened out and went sock-ish instead. This looks nothing at all like me...more the sort of cat Sally Bowles would have in Cabaret... but its the glamourous bold kind of creature I was surprised came out of my needle and I like its brash confidence. One comment on its appearance was "the cat in the hat's evil twin brother", but I think its got rather a whimsical smile. Wait a minute...you CAN see its legs. I have found a full length picture! 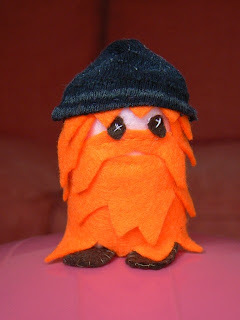 Here's a chance to get to know me a little better by meeting my husband....in his felted form. If you ever meet him in real life you will recognise him instantly as they are very similar. He is a writer, artist and very keen tablet draw-er. If you want to see what he doodles check here . A lovely crafty friend of mine made our whole family in felted form...look out for those coming soon! There are lots of Socklets around the house, mostly hibernating in cardboard boxes , made over the last few weeks, months or in some cases years. So every so often I shall post a Socklet Archive and let you peruse some socks from a bygone era. This funky pair were made for my daughter and her friend, who was about to emigrate to Australia. ﻿Green Socklet was the first to discover that the thaw was on its way. Having watched the Snowman and the Snow dog on TV, we were banned from making any snowmen as a family because of the trauma this can cause. I am working on a short tutorial on making these socklets and will post it as soon as it is done. Not everything I make is sock-related but a darn, large amount of it will be! These little critters enjoyed the recent snowfall but had to dry out their feet down the back of the radiator when they came back inside. I made these cute little socklets out of a set of baby socks. They have multi-layered button eyes and sewn mouths and a marble in each foot to keep the shape and weight right. They are very quick and easy to make on a sewing machine with a little bit of hand sewing at the end. Their friend has now melted and joined the great universal rain-cycle in the sky.